Due to Summer Travel and my impending Wedding, I probably won’t be posting very much until August. I have several new decks in the works (Mogis, Anax and Cymede, Asmira, Reki, Jhoira), and I may get the chance to play a few of them this summer. If I do, I’ll try to update the blog, but no promises! If there are any EDH or Commander players/venues in Barcelona, Copenhagen or Stockholm and you’re interested in a game, I’ll be in those areas in July, and I plan on bringing a deck or two with me just in case. Contact me via this blog. I was excited to try this deck out on my last regular Wednesday game for awhile. I had a very landy hand including the first Cavern of Souls (cleric) I had ever put in a deck. 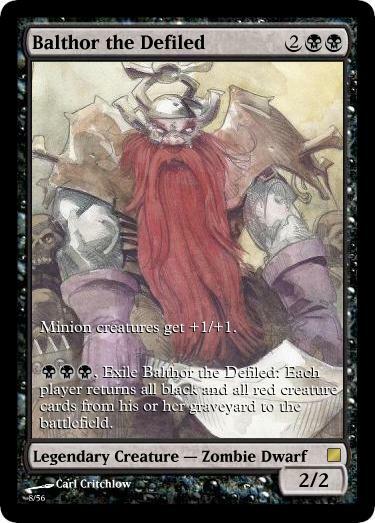 Liliana (of Balthor) was making people Discard, and Sisay fetched up a Tolsimir and started building up an army of other legendary thigns, but then Balthor Decree of Pain-ed. I cast Obzedat’s Aid to get back a discarded Treasury Thrull and had a Harvester of Souls, but I stalled out at 5 lands. Balthor got pretty messy with Candelabra of Tawnos and Yawgmoth’s Will (that got him back two tutors, one of which got a Coat of Arms). Balthor killed Arcades and left Sisay at 1. I was at a large life total (And I banishing light-ed the Coat of Arms), but I could’t hold off his Akroma’s Memorialed army, and I lost. I played the deck again immediately afterward, but I didn’t record the game (because the first game wasn’t bad enough to warrant a re-do, and also because I wanted to focus on playing). I do remember that I got to looping some Shadowborn Apostles with Edgewalker, and that Athreos actually did quite a bit of general damage before I lost the game. I was initially bummed about Athreos because it didn’t fit right in to Teysa, but then I decided it would actually make a fun different BW strategy. I had first thought of making it a “Seventh Seal” deck with a Grim Reaper and then making it Chess themed with black and white knights and clerics etc, but eventually I decided I didn’t want to be that theme-y with this build. Several people online had posted Cleric/Shadowborn Apostle based decks, which I liked. I have a “divine” cleric deck (Heliod/Avacyn/etc.. ultra mono white) and a Demonic Deacon deck (with Nefarox, 13 demons and Shadowborn apostles), so I decided to make a BW cleric deck as well (Becasue I’ve always wanted to try Egdewalker). In building the deck, it also kind of became a Constellation deck and took on a heavy Enchantment theme. There’s at least one Enchantment creature cleric that is free with Edgewalker. This deck started from a huge pile of cards. I enjoy playing it, but I’ve found that mostly people let me recur things rather than taking damage.